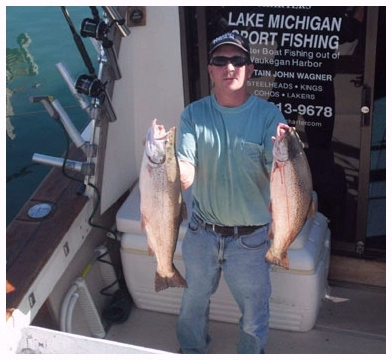 Captain John Wagner is a seasoned mariner with more than 30 years of experience fishing Lake Michigan. Captain John is U.S. Coast Guard licensed and certified by the State of Illinois as well as being fully insured. Captain John was introduced to fishing on Lake Michigan as a young boy by his father, and has loved fishing ever since his early days on the lake. Captain John received his Captain's license in 1989 and is also a certified mechanic. The Playin' Hooky is maintained with only top quality parts and the Captain makes sure everything is operating properly before you ever step foot on board. Captain John is an award winning fisherman himself. 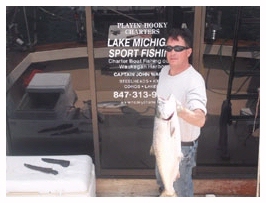 With his experience you will be sure to catch fish while on the Playin' Hooky. If you have out of town guests staying with you, introduce them to the view of Chicago from the Lake, it is outstanding. You and your guests will have memories that will last a lifetime if you book a trip with Captain John. Motion sickness pills - If you are prone to motion sickness, take appropriate medication the night before, and approximately one hour before departure. Click here for additional tips on preventing seasickness. If this is your first trip with us, please be sure to check the list above. If you follow our recommendations, it will help ensure you and your group have a fun, safe and productive trip. Playin' Hooky Charters is dedicated to your satisfaction. We provide the finest Salmon and Trout fishing on the Great Lakes. Trout Fishing On Lake Michigan with Hooky Charters Is a great way to bring old friends together! The years of experience Capt. John has on the lake not only increases the safety of your group, but also ensures a safe and bountiful fishing trip. If you would like to view pictures of some of the 2012 catch, click here to go to the photo gallery. Captain John Wagner follows a no fish no pay policy. Hello.... My name is Capt. John Wagner and I would like to thank you for visiting our website. I have been fishing Lake Michigan for over 30 years. I am licensed by the U.S. Coast Guard as well as the State of Illinois. When you fish with Playin' Hooky Charters, all of your equipment is provided for. We always have a Cell Phone on Board. If you're having problems catching fish you have come to the right place. Capt. John Wagner has been fishing Lake Michigan for more than 30 years and his experience will get you "on the big ones". If you're looking for a lake Michigan fishing Charter look no further! Feel free to call if you have any questions. If you're looking for big fish we can help you find them. Come aboard the Playin' Hooky, we promise to do our best to show you a great time. The best in Chicago fishing charters. We offer Salmon and Trout Charter boat fishing in Illinois. Catch Salmon and Trout on Lake Michigan. Charters leave from beautiful Waukegan harbor. Captain John is a proud member of the Waukegan Charter Boat Association.